A study performed by an international team led by the Barcelona Institute for Global Health (ISGlobal) reports a link between exposure to blue light at night and higher risk of developing breast and prostate cancer. Blue light is a range of the visible light spectrum emitted by most white LEDs and many tablet and phone screens. “WHO’s International Agency for Research on Cancer (IARC) has classified night shift work as probably carcinogenic to humans. There is evidence pointing to an association between exposure to artificial light at night, disruption of the circadian rhythm, and breast and prostate cancers. 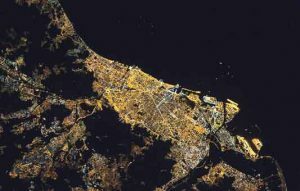 With this study researchers sought to determine whether night exposure to light in cities can affect the development of these two types of cancer. “We know that depending on its intensity and wave length, artificial light, particularly in the blue spectrum, can decrease melatonin production and secretion”, says Martin Aubé, physics professor at CÉGEP in Sherbrooke, Canada and study co-author. The study was conducted within the framework of the MCC-Spain project cofunded by the ‘Consorcio de Investigación Biomédica en Red de Epidemiología y Salud Pública’ (CIBERESP), and includes medical and epidemiological data of more than 4,000 people between 20 and 85 years of age in 11 Spanish regions. Indoor exposure to artificial light was determined through personal questionnaires, while outdoor levels of artificial light were evaluated for Madrid and Barcelona, based on nocturnal images taken by astronauts aboard the International Space Station. 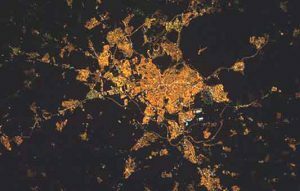 “Currently, the images taken by the astronauts on the Space Station are our only way of determining the colour of outdoor lighting at a large scale, and the spread of blue light-emitting white LEDs in our cities”, comments Alejandro Sánchez de Miguel, scientist at the Astrophysics Institute in Andalucía-CSIC and Exeter University. Ariadna García, ISGlobal researcher and first author of the study, says: “Given the ubiquity of artificial light at night, determining whether it increases or not the risk of cancer is a public health issue”. At this point, further studies should include more individual data using for instance light sensors that allow measuring indoor light levels. It would also be important to do this kind of research in young people that extensively use blue light emitting screens”. The study shows an association with hormone related cancers using extensive light and individual risk data: more exactly, the findings show an association of blue light with increased breast and prostate cancer risk. Sources of blue light include the sun, digital screens (flat TVs, computers, laptops, smartphones and tablets), electronic devices, and fluorescent and LED lighting. But why is exposure to blue light at night important? Melatonin plays a key role in regulating the day-night cycles and has several other key functions, for example it is a powerful anti-oxidant and has also an anti-inflammatory function. It is also important because exposure to this light spectrum has rapidly increased both in public and private places due to the massive use of LED and of indoor sources such as tables and smartphones. We do not have a good quantitation of which are the most important sources of blue light in a population, also because these sources have changed and are changing dramatically in recent years. The blue spectral content in “normal” light bulbs is less than in white-LEDs but it is still present. Different experiments have tested the impact in melatonin suppression of different light sources finding a significant role of wavelength compared with light intensity. It is not that blue light is the only one to affect circadian disruption, but it is the one affecting most. So should we take preventive measures, and which should these be? this association in more detail. This will allow to take evidence-based preventive measures in the near future. This said, the hypotheses they tested were not arbitrary, but are based on biology and on light physics. Researchers were aware that the population at large is more exposed because most cities are changing (classical lights to LED and mostly “hard” LEDs that emit more blue light spectrum for efficiency reasons). While new studies bring stronger evidence in humans, cities should consider limiting emission of blue light outdoors. There are several ecological studies that show an environmental impact on wildlife. That is why several institutitions, including the EU-Joint Research Center, the American Medical Association, and in Spain the Junta de Andalucía and the Generalitat of Catalunya recommend the limitation of the blue emission at different levels. What else do we know about breast and prostate cancer? We know that they are hormone related cancers. We know that breast cancer is associated with reproductive history, for example age of menarche, breastfeeding, age of birth of first child. Also with alcohol consumption, obesity (in postmenopausal women only), lack of physical activity. We know little about environmental exposures affecting breast cancer, except for the risk associated with night shift work and exposure to light at night. For prostate cancer we know very little except for the importance of genetic factors. Prostate cancer too has been associated with night shift work and light at night. Regarding the association between breast/prostate cancer and melatonin suppression the mechanism of action underlying the anti-oncogenic activity of melatonin has not been completely established, with several biologic pathways having been suggested. What can we do to protect ourselves from blue light exposure? Our eyes’ natural filters do not provide sufficient protection against blue light rays from the sun, or blue light emanating from electronic devices or from blue light emitted from LEDs. The most obvious measure is to limit exposure and these kind of measures have to be taken both at a societal levels (e.g. city lights), industry levels (e.g. brightness of PCs etc) and individual level (e.g. hours working with e-devices, lighting in houses etc). Evaluating the association between artificial light-at-night exposure and breast and prostate cancer risk in Spain (MCC-Spain study).